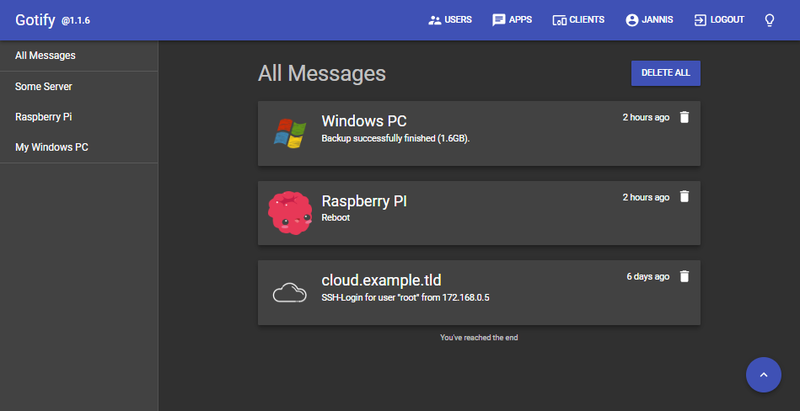 We wanted a simple server for sending and receiving messages (in real time per web socket). For this, not many open source projects existed and most of the existing ones were abandoned. Also, a requirement was that it can be self-hosted. We know there are many free and commercial push services out there. The docker image is available on docker hub at gotify/server. Also there is a specific docker image for arm-7 processors (raspberry pi), named gotify/server-arm7. Visit the releases page and download the zip for your OS. Download go dependencies with golang/dep. Commands must be executed inside the ui directory. Star the UI development server. Open http://localhost:3000 inside your favorite browser. The UI requires a Gotify server running on localhost:80 this can be adjusted inside the ui/src/index.tsx. The project has a CGO reference (because of sqlite3), therefore a GCO cross compiler is needed for compiling for other platforms. See .travis.yml on how we do that.